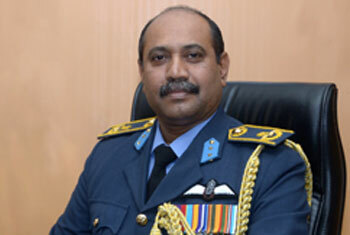 Air Vice Marshal D.L.S Dias has been appointed as the new Chief of Staff of the Sri Lanka Air Force (SLAF), Air Force spokesman said. He was the first Chairman of SLAF Tug of War in 2011. He was the Chairman SLAF Athletic in 2012. Presently he is the Chairman SLAF Cycling. Dambure Liyanage Sumangala Dias joined the Sri Lanka Air Force on 13th December 1984 as an Officer Cadet in the General Duties Pilot Branch in the 13th Officer Cadet intake. On completion of the Basic and Advanced phases of flying training, he was commissioned as a Pilot Officer in the GDP branch on 15th August 1986. Air Vice Marshal Dias has completed his Staff Course at the Defence Services Staff College in Wellington, India in 2001 and completed National Defence Course in Mirpur, Bangladesh. He has also completed Junior Command and Staff Course in India, Joint Air Warfare Course at IAF, India and Air Craft Accident Investigation Course, Pakistan.